NY Bagel Scam victims are speaking out and being heard. 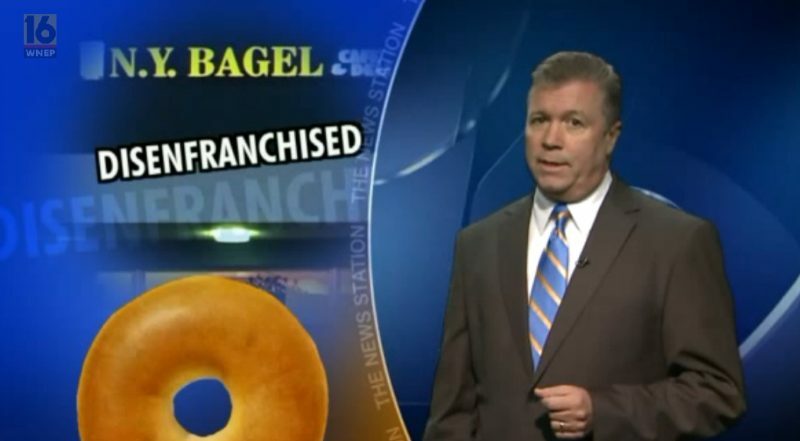 ABC affiliate WNEP has aired a stern warning about the NY Bagel Café franchise scam now running on Craigs List and elsewhere. Investigative journalist interviewed Bloomsburg, PA victim John Willis, Tracy, CA victim Amber Robinson and UnhappyFranchisee.Com publisher Sean Kelly for this important story. Watch below. (UnhappyFranchisee.Com) There are two groups of NY Bagel Café scam victims. Bloomsburg, PA NY Bagel scam victim John Willis is in the largest group: those who paid the company a supposedly refundable up-front fee for a 100%-financed, new NY Bagel Café franchised store. NY Bagel Cafe salesman Dennis Mason had used fraudulent documents and numerous misrepresentations in violation of federal franchise laws to sell John Willis on his no-risk offer. Once the $24,500 fee cashier’s check was cashed, Mason referred him to a shady “lender” named Howard Fichman who wanted to charge Willis an exorbitant fee to sign him up for hundreds of thousands of dollars in high-interest credit cards. Even after being confronted with the illegality of the sale and contractually promised return of the fee, NY Bagel President Joe Smith refused to return Willis’ hard-earned money. We have heard the same story from dozens of other victims. Amber Robinson, a military veteran and widowed mother of two, is in the group that is smaller in number but whose losses are much higher: Those who used their own funds and opened a NY Bagel Café franchise. Although NY Bagel Café has never been legally registered to sell franchises in California, Mason sold her an illegal franchise for Tracy, CA. Her NY Bagel Café store closed 6 months to the day after it opened. NY Bagel Cafe Scam Victims: Contact Us & Be Heard! Joe Smith and Dennis Mason have gone to great lengths to hide the nearly 40 failed stores and the fact that the NY Bagel Café operating model simply doesn’t work. John Willis and Amber Robinson were both interviewed by investigative reporter Dave Bohman. UnhappyFranchisee.Com publisher Sean Kelly worked behind the scenes with Bohman, put him in touch with victims and showed him how to cut through the NY Bagel façade of success. Thanks Dave Bohman, John Willis and Amber Robinson for helping us warn potential victims of the NY Bagel Cafe scam. Have you given money to NY Bagel Cafe, Dennis Mason or Joe Smith and not been able to get financing or open a store? Contact us in confidence at UnhappyFranchisee[at]gmail.com. ← Is GNC Unfairly Competing With Its Franchise Owners? Hi my name isNazim and i have problems with New York bagel cafe they don’t give me my money back. So please call me or email me. [redacted].